↑ This is the original filing date of the application which led to US Patent 3,503,060, generally accepted as the definitive disk drive patent. ↑ Kean, David W., "IBM San Jose, A quarter century of innovation", 1977. ↑ Hutchinson, Lee. (2012-06-25) How SSDs conquered mobile devices and modern OSes. Ars Technica. Retrieved on 2013-01-07. 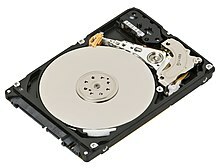 HDD from inside: Tracks and Zones. How hard it can be?